Undertaker was originally founded in 1993 under the name Maledict by guitarists Matthew Rinehart & Mikel Wojtyszyn and drummer Dave Rodgers. Brian Fisher soon joined the band on bass. Later that year Wojtyszyn was replaced on guitar by Otto Larson from Salt Lake City, UT. Dallas Brown, also from SLC, joined on as the lead vocalist. The group renamed themselves Undertaker and the line up was complete. In late 1993, the group entered Time Capsule Recording Studios in Denver to track their first and only studio effort to date, Necro-Thievery. Kirby Orrick engineered the sessions. Friends from Skeleton of God also helped out on the recording on background vocals. 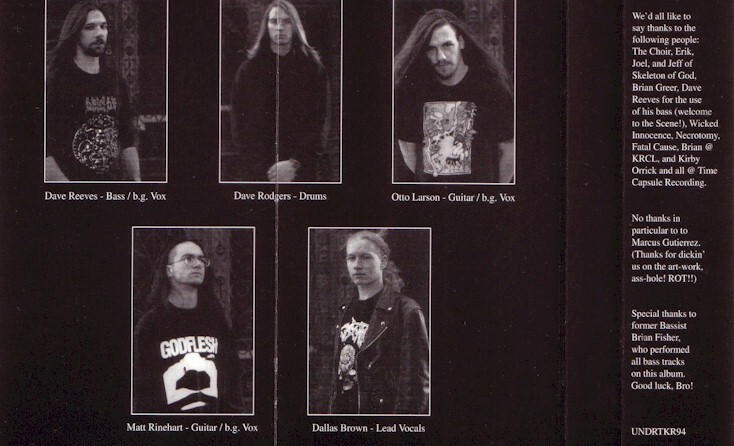 As the mastering and artwork were completed, some shake-ups in the band saw the departure of Fisher and the subsequent hiring of Dave Reeves (also from SLC) on bass. Also during this time, negotiations took place between Undertaker and indie death metal label CREEPO Records (which later became Napalm America Records); which also featured Skeleton of God in its ranks. 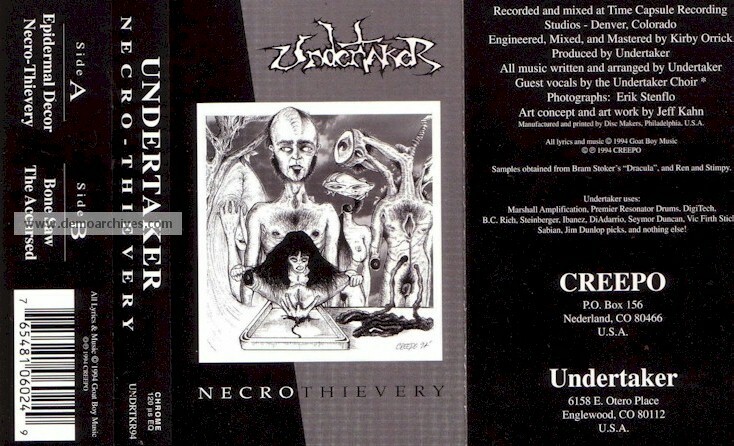 By the time the CD was released in early 1994, Undertaker had inked an exclusive distribution deal w/ CREEPO and the CD was released world-wide. The band continued playing in support of the release throughout the Denver Metro area and surrounding region through the summer 1994. Late that summer, Rinehart left the band to pursue other interests. In early 1995, the Undertaker officially disbanded. Pro Glossy cover. Pro printed red tapes.